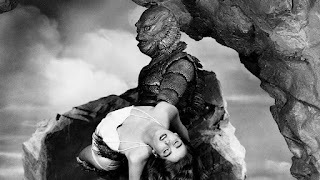 Clearly The Creature from the Black Lagoon isn't a creepy character in any way, but I've always been a Universal Monster fan and adored the creature. I have the boxed set when the Universal Studios released the limited edition DVD set and bust before the release of Van Hesling. The set had Dracula, Frankenstein, and the Wolf man. I ordered the other packs separately - The Invisible Man, The Mummy and Creature from the Black Lagoon. I had my son watch these with me when he was younger, figuring them pretty tame. We had fun with all three. He asked me if the creature lived in Florida. We would play "creature" in the swimming pool when chasing each other. I did a photoshop of him in a creature costume. Since then my friend has bought me various creature collectables, and I have collected a few of my own at conventions. I have two creature T-shirts, one creature necklace (a gift), the creature stuff animal from the Universal stuffed collection, and a creature keychain. Years ago at a convention, I happened upon an artist's table, and he had done a redo of the original movie poster. I bought it from him, having his signature on it. In 2013 we went to the convention again, and for the first time Julia Adams (from the original movie) was there. I had her sign the poster, as well as Ricou Browning (who played the underwater creature.) This artwork is of course special and my prized "poster" with all three signatures!